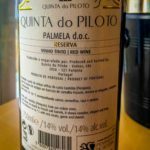 The name intrigued us as pilots (both aviating and sailing); the quality of the wines cemented our affinity for Quinta do Piloto, near the town of Palmela, in the Palmela DOC within the Setúbal viticultural region south of Lisbon. Perched up on a ridge overlooking the Tejo River in one direction, and–over the hill–the coastal resort of Setúbal, the quinta has been making wines since the 1940s. We’ll look at their entire lineup of wines in detail, but for this week, we suggest our favorite of the table wines, one that exemplifies the unique process within the winery and a key grape of the region: Castelão. The Reserva Castelão undergoes essentially the same vinification as has been plied at the quinta for generations. Using the hill as a gravity feed, the grapes go into a classic destemmer, then move to the series of cement vats for fermentation. Without the temperature control of a modern winery or stainless steel tanks, the grapes transform, somehow, through this rustic journey into an elegant wine. After spending 1.5 years in new French oak, they go into the bottle–3,000 bottles from this particular vintage–at 14% ABV. I instantly thought of coelho assado (roasted rabbit) when I smelled the wine–it’s a big “autumn” red with currants throughout and a bit of spice to complement grilled game scattered with coentros (cilantro or coriander leaves). The medium tannins give it structure and balance, and I swear you could also scent an echo of the minerals from the vats. 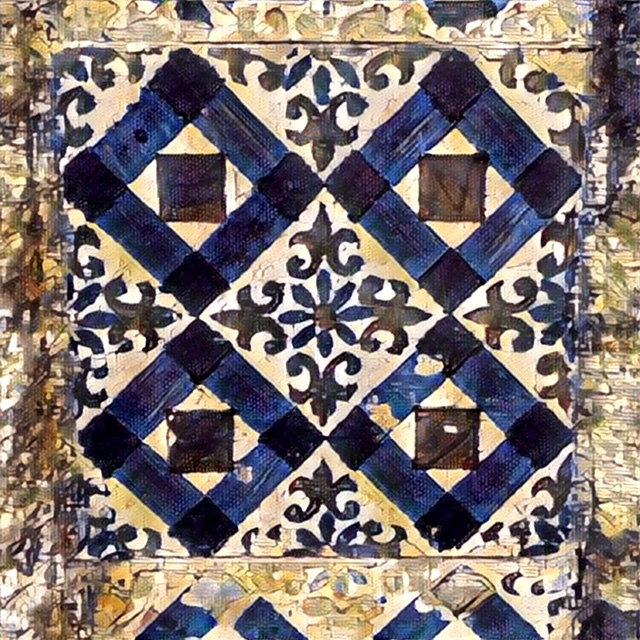 The Lisboa viticultural region features a broad variety of grapes and styles, in part because of the widely varying topography and climate across this part of Portugal. Historically important, the site of Quinta da Romeira has hosted wine production since the days before the Duke of Wellington arrived in what is now known as the Bucelas DOC. Bucelas lies across valleys inland from both the ocean and the Tejo River, and it’s influenced by both. 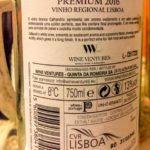 The DOC’s white grape is the versatile Arinto; combining it with anything else renders the wine a “VR” (vinho regional) instead of a DOC designation. The Calhandriz white blend that we tasted marries the flagship Arinto grape with the classic Chardonnay grape to create a sprightly wine. This white features lots of lemon on the palate and nose, with a whiff of petrol. We enjoyed its good acidity with our creamy spaghetti carbonara (which we make with the local choriço instead of ham or bacon). 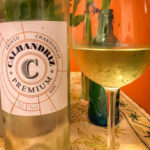 The companion vinho tinto Calhandriz blends Cabernet Sauvignon and Touriga Nacional for a lively cherry-driven wine–the 2016 is a bit young still, but should be best in about a year. As we come through the other side of two weeks of rain, we revel in the sun! The second bottle given to us for tasting last week feels like a great fit for upcoming warmer days, though I’m a fan of rosé any time of year. 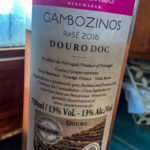 The Gambozinos rosé from DOC Douro that we tried comes from a small producer, Depathernos, and should earn a spot on the carta de vinhos at the new local spot in Praia das Maçãs, Porreiro. Depathernos keeps its vines in the Rio Torto valley, though the rosé blend adds Tinta Roriz from the Tabuaço zone. 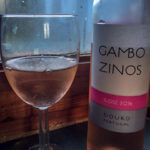 The wine shows moderate alcohol for a rosé (13%), with good balance, and with a freshness not unlike its blushing peach color in the glass. I found a bright shot of watermelon to accompany the more usual red fruits typical in a rosé from these grapes. We enjoyed the wine with our petiscos (tapas), including presunto (proscuitto), cheeses, and tomato jam. The sun shining through the rain drops! We’re often asked to look at wines for friends in the industry, and those who’d like our help in selecting a special bottle. 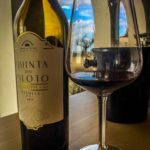 For our first two March 2018 wines, we’ll tell you our notes from a couple of those tastings for a new restaurant opening in Praia das Maçãs this spring, Porreiro (and more to come later). 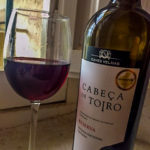 The Caves Velhas brand includes a series of the Cabeça de Toiro wines; the one we had last weekend was a tinto from their reserve line, featuring two strong grapes: Touriga Nacional and Castelão. The combination, for me, played like a Napa Rutherford Cabernet Sauvignon–especially with the note of dust on the nose and early palate, along with black plum. There’s a hint of menthol as well, along with dark berries throughout. While there wasn’t much of a back end to it, the wine punches well above its weight price-wise. 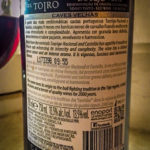 We hope that Porreiro keeps it on the menu.